Sidney Schectman: "... we rejected what was going on at the Whitney Museum on Eighth Street which had exhibition after exhibition devoted to people like Brackman and Luigi Lucioni and the Blanche pair, Lucille and Arnold, and Alexander Brook. We called it silo art, paintings of barns." 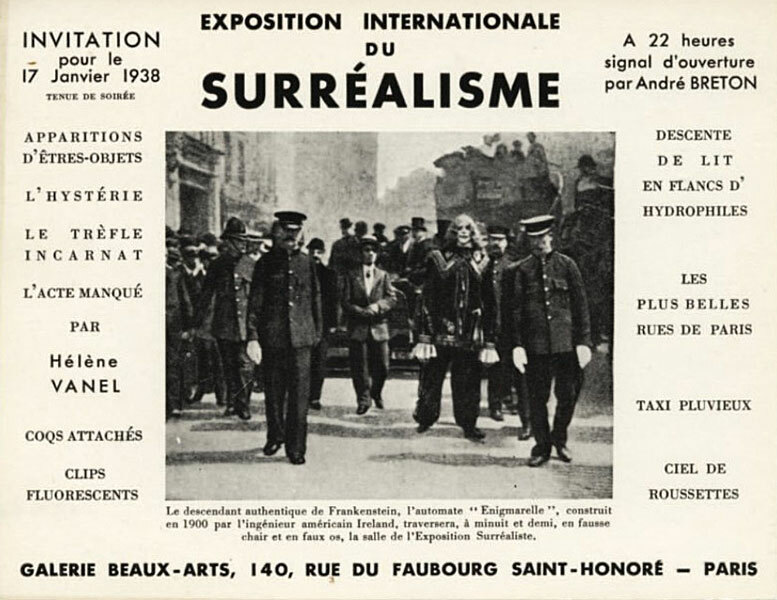 January - February 1938: "Exposition internationale du surréalisme" at the Galerie des Beaux-Arts in Paris. January 24, 1938: Peggy Guggenheim opens Guggenheim Jeune in London. 1938: Picasso exhibition at the Valentine Dudensing Gallery. January 1938: Barnett Newman fails an exam. February 11, 1938: Franz Kline departs London for the U.S.
February 1938: Arshile Gorky paints a Valentine for Leonore Gallet. ... Gorky painted a number of flower still-lifes in the late 1930s. Giorgio Cavallon, who was still on hand at 36 Union Square as one of Gorky's WPA assistants, recalled a day when two ladies from Philadelphia brought Gorky fresh flowers and he set to work producing one flower painting after another until the blossoms had drooped and died. He sold one of these for fifty dollars. Another he gave to Gaston de Havenon as a wedding present; Mina Metzger acquired two others... One of Gorky's 1939 flower paintings is inscribed: 'To My Lovely Leonora With Love Arshile 1939.' It was a gift to Leonore Gallet, a tall slender, blue-eyed redhead who played the violin in a symphony orchestra and whose father was a Michigan steel manufacturer. Their love affair began early in 1938 when he made her a valentine painting with doves and a heart contained inside what looks like an apple. Leonore appears in at at least two of Gorky's drawings, once with her violin and once lying in bed with the covers pulled up - likely a sickbed picture. March 1938: Adolph Gottlieb paints circus performers. March 1938: Barnett Newman fails again. 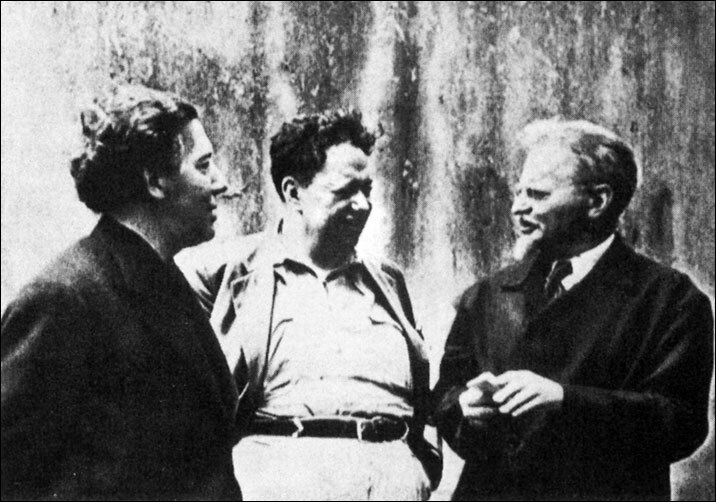 April 28, 1938: Stuart Davis and Raphael Soyer support Moscow Trials. May 5 - 21, 1938: "The Second Annual Membership Exhibition: American Artists' Congress" takes place at Wanamaker's. Instead we see an ever widening circle of artists expressing through the programs of the American Artists' Congress, and the various artists' unions, their faith in art and in the possibility of maintaining and extending the democratic conditions in society in which it can develop. May 24 - June 15, 1938: "Federal Art Projects - Murals for the Community" at the Federal Art Gallery, 225 West 57th Street, New York. Summer 1938 - 1939: Robert Motherwell lives in Europe. Motherwell sailed to the U.S. from England after visiting some Oxford Fellows there that he had met in Grenoble. June 9, 1938: Jackson Pollock is dismissed from the Federal Art Project. June 12, 1938: Jackson Pollock is admitted into Bloomingdale Asylum. June 1938: Adolph Gottlieb leaves Arizona. July 25, 1938: André Breton signs Leon Trotsky's manifesto: "Towards a Free Revolutionary Art." Trotsky had ended up in Mexico the previous year (1937) after being deported from Russia in 1929 and living in exile first in Turkey and then, in 1933, France (where he was forbidden from traveling to Paris) and finally, in 1935, Norway, After two years in Norway he was put under house arrest and was transferred to Mexico on a freighter. In Mexico he lived for a time with Diego Rivera and and then with Diego's wife Frida Kahlo (with whom Trotsky had an affair). He was murdered in Mexico on August 20, 1940. Trotsky's manifesto railed against the Soviet Union as much as HItler's Germany. From "Towards a Free Revolutionary Art:"
Insofar as it originates with an individual, insofar as it brings into play subjective talents to create something which brings about an objective enriching of culture, any philosophical, sociological, scientific or artistic discovery seems to be the fruit of a precious chance, that is to say, the manifestation, more of less spontaneous, of necessity... Specifically, we cannot remain indifferent to the intellectual conditions under which creative activity takes place, nor should we fail to pay all respect to those particular laws which govern intellectual creation. In the contemporary world we must recognize the ever more widespread destruction of those conditions under which intellectual creation is possible... The regime of Hitler, now that it has rid Germany of all those artists whose work expressed the slightest sympathy for liberty, however superficial, has reduced those who still consent to take up pen or brush to the status of domestic servants of the regime... If reports may be believed, it is the same in the Soviet Union, where Thermidorian reaction is now reaching its climax... True art, which is not content to play variations on ready-made models but rather insists on expressing the inner needs of man and of mankind in its time - true art is unable not to be revolutionary, not to aspire to a complete and radical reconstruction of society... We recognize that only the social revolution can sweep clean the path for a new culture. If, however, we reject all solidarity with the bureaucracy now in control of the Soviet Union it is precisely because, in our eyes, it represents, not communism, but its most treacherous and dangerous enemy. Summer 1938: Mark Rothko and his wife move to East 6th Street. Summer 1938: Juliet Browner moves out. Summer 1938: Yves Tanguy exhibition at Guggenheim Jeune in London. During the summer of 1938, Peggy Guggenheim swept the remarkable Yves Tanguy, with his polished dome of a head sprouting a few unruly tufts of hair, off to England for an exhibition of his work in her gallery. 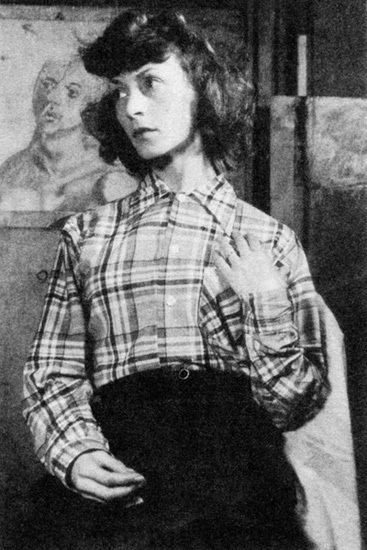 Separated from her husband, the painter Lawrence Vail, Guggenheim, with the guidance of Herbert Read, had began to put together a collection for a museum of twentieth-century art, and, as she detailed unreservedly in her memoirs, had also commenced her collection of artist-lovers, among whom she claimed Tanguy. Returning from England in an unaccustomed state of affluence, Tanguy reportedly threw wads of money at people in cafes. Summer 1938: Arshile Gorky goes to Provincetown. Late Summer: Franz Kline moves to New York. Autumn 1938: Adolph Gottlieb returns to New York from Massachusetts. Late Autumn 1938: Willem de Kooning meets Elaine Fried. October 1938: Arshile Gorky gets a commission for the World's Fair. Gorky received a commission for murals in the Aviation Building at the World's Fair. Builders had been working in Gorky's studio since the summer, making it difficult for him to work there. He hoped to complete the sketches for his work after they left on October 20th. October 29, 1938: The New York Times announces the formation of the American Veterans Society of Artists. The article announced that "an organization consisting of artists who were with the United States forces in the World War" has been formed, including "many of the country's well-known painters, sculptors and graphic artists. Plans are being completed for the first exhibition to be held this coming Spring. Citizens of the United States who formerly fought with the allied armies are also eligible. The present headquarters of the society is the studio of Charles A. Hafner, chairman of the membership committee, 112 West 54th Street." November 2, 1938: The Whitney Annual opens. November 5 - 26, 1938: "The Ten: Whitney Dissenters" exhibition at the Mercury Galleries. The Mercury Galleries were located on West 8th Street, two doors down from the Whitney. (RO204-5) Schectman had previously owned a gallery at 412 Sixth Avenue - the Art Mart. Gallery co-owner Schectman recalls that "in this $5 to $50 category" were "a series of very important etchings by Picasso, Masson, Tanguy - in that category, Hayter was in that group, which was put out by a society for the support of the Spanish War of Liberation and signed by Paul L. Wolp with a forward to it. And we paid $12... And that collection ["Solidarity"] is probably worth between $15 and $20 thousand [in 1981]. The current nine members of The Ten were listed in the exhibition's brochure as Ben-Zion, Ilya Bolotowsky, Adolph Gottlieb, John D. Graham, Louis Harris, Ralph M. Rosenberg, Marcus Rothkowitz (Mark Rothko), Louis Schanker and Joseph Solman. Earl Kerkam also exhibited as a "guest." Each artist showed two paintings. Adolph Gottlieb showed Pete Machady's Place and Wrestlers. John Graham showed Bull Fight No. 1 and Bull Fight No. 2. Mark Rothko showed Movie Palace and Conversation. The title of this exhibition is designed to call attention to a significant section of art being produced in America... It is a protest against the reputed equivalence of American painting and literal painting. See The Ten: Nine Artists in Search of a Cause. November 21, 1938: "What's Wrong with American Art" is broadcast on WNYC radio. ... we two [Braddon and Sidney Schectman], with the late Louis Harris who at that time was a member of The Ten, went on the air on Station WNYC... This was timed for the exhibition of The Ten: Whitney Dissenters. November 1938: Jackson Pollock is accepted to the easel division of the Federal Art Project. December 3 - 5, c.1938: The Ten hold an auction. The auction was held at the Brooklyn Heights Branch of the American League Against War and Fascism at a venue at 85 Clark Street, Brooklyn. Publicity for the auction announced "The '10' will hold an Art Auction Benefit of Spanish Children," promising "paintings, water colors, drawings and prints." December 5, 1938: Franz Kline marries Elizabeth V. Parsons. December 1938: Annalee Newman passes exam to teach secretarial skills.